Photo challenge: boundaries constantly invite us to push against them. 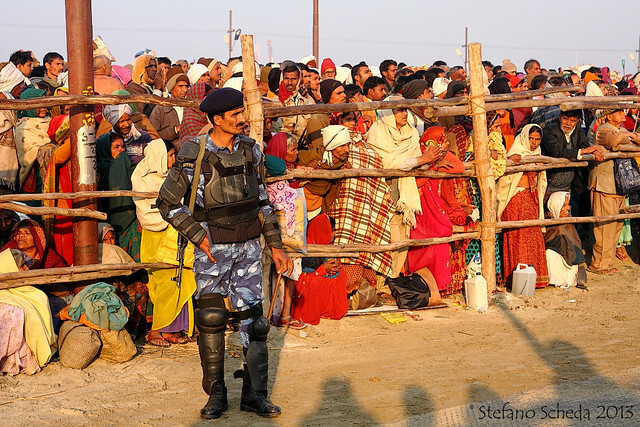 Pilgrims waiting for the sadhu chariots at Kumbh Mela – Allahabad, India. Thank you Noortje. I don’t like the shadows on the lower right but I could not avoid them. Love the color and light. This is perfect for the challenge. I’m going to link so my readers can enjoy it too. Thank you, Dawn. For stopping by, commenting and linking. Love this one Stefano! You are always so original and so on-point with your responses! Thank you so much, Tina. You’re so kind. At first I considered some dull border posts pictures, then I came up with this one.